We subjected Tri-Fortify® to 104°F/40°C and 75% humidity for 90 consecutive days and the product still exceeded label claim. “I really love Tri-Fortify Orange. Of all the dozens of supplements and meds I take, Tri-Fortify is by far my favorite. I feel powerful results literally within seconds, every time I take I take a teaspoon. I get a significant increase in energy, mental clarity and my breathing opens up. 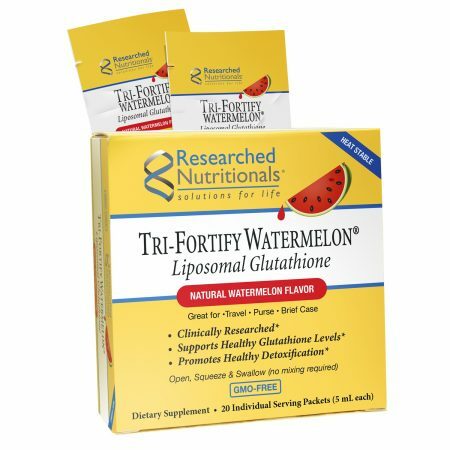 The delicious orange taste mixes well with other liposomal supplements I take.” – Brian B.
Tri-Fortify Orange® and Tri-Fortify Watermelon® are registered trademarks of Researched Nutritionals, LLC. All rights reserved. Contains: Ingredient partially derived from soy. Free of: Milk, eggs, fish, crustacean shellfish, tree nuts, peanuts, wheat and gluten. 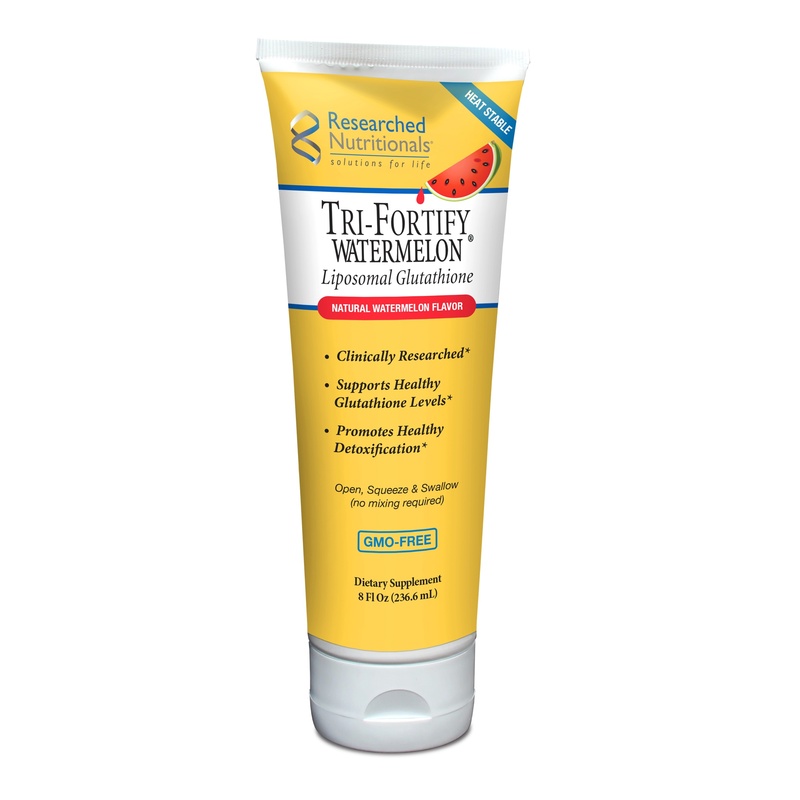 Suggested Use: As a dietary supplement, gently squeeze the tube to fill 1 teaspoon (5 mL). Hold under tongue for 30-60 seconds, and then swallow or use as directed by your health care professional. Additional doses may be taken. Shake tube well before use. Cautions: If pregnant or nursing, consult your health care professional before use. What is the source of the glycerin? It is naturally derived from Palm oil. What is the source of the glutathione? We use a natural glucose fermentation process. What is the source of the medium triglycerides? It is derived from coconut oil. If I have a soy sensitivity, do I need to worry? Generally, it is not an issue. We derive the liposomes from soy lecithin but we use only the lipids (i.e. phosphatidyl choline) as opposed to soy protein (the common allergen). However, we always recommend checking with your healthcare professional regarding your personal situation. Is the product hexane-free? Yes. What is the source of the vitamin C? It is derived from corn. Does the tube contain BPA? No. We do not have any BPA (bisphenol A – an industrial chemical that has been used to make certain plastics and resins) in our products. Is the product Vegan? Yes, this is a vegan product. 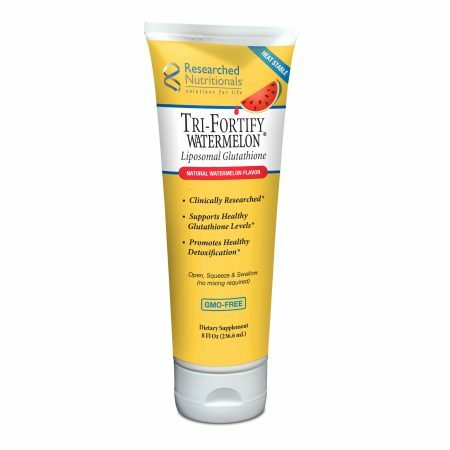 What is the source of the watermelon flavor? Organic compounds commonly found in watermelon and lemon grass. What is the purpose of the Glycerin? Glycerin has two functions. 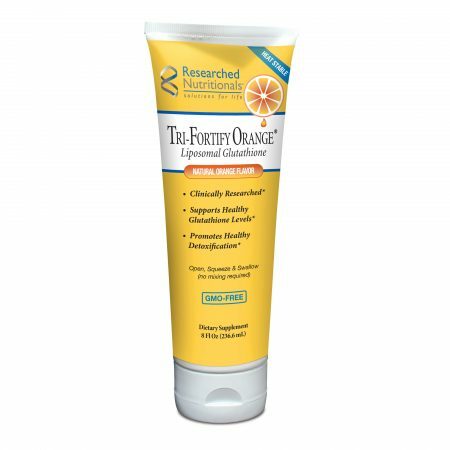 First it helps to prevent oxidation of the Vitamin C and Glutathione. Second it contributes to the sweetness of the product. How much natural sugar is in the product? 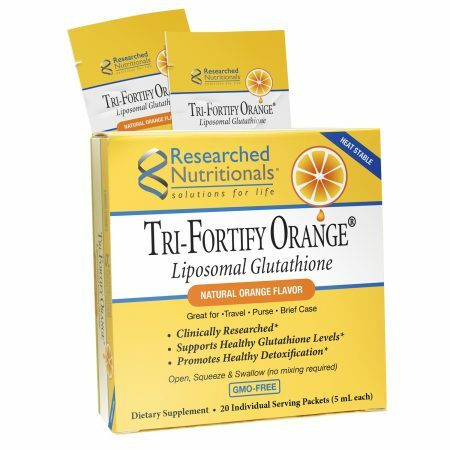 Tri-Fortify™ contains .032g per serving of natural sugar. No sugar is added to the product.